Mytholmroyd residents by the bricked up path nea the old Post Office. Angry residents of a Mytholmroyd housing development have hit out at the construction of a wall which they say blocks their access to the main road. The wall, at Longfellow Court, now restricts residents’ access to the A646 Burnley Road. They say the land has been used as a pedestrian walkway for decades and are concerned about the wall’s impact, particularly for older residents. But Calderdale Council says the walkway is not listed as a public right of way. Concerns have also been raised about the possibility of the flood risk, as residents say the area can fill up and the walkway was an escape route for the water. Jeff Kessler, 57, who lives at Longfellow Court, said: “There has been no consultation or anything. This has been a long-standing footpath. 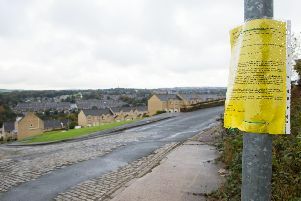 It is thought the land was previously owned by Calderdale Council, but was sold to developers at auction in August 2014. Coun Karl Boggis, Mayor of Hebden Royd, said: “Why did Calderdale’s planning department grant permission to the developer of Longfellow Court, including the stepped access, when the steps lead on to someone else’s land, if there was no established right of way? “Was any consideration given, at the same time, for this access to be used as an emergency escape route and if so, why is it not appropriate now? “And where are these residents expected to escape to now, should a need arise? “What are Calderdale’s planners doing about the site’s new owners having large trucks delivering and collecting stone from the new stone yard, when they may have to reverse from the busy A646 Burnley Road?” added Coun Boggis. Hebden Royd Town Councillor Elizabeth King (White Lee, Green), said: “I am very concerned that a right of access that people have used for a long time has been taken away. Mark Thompson, Calderdale Council’s acting director of economy and environment, said: “We have not received any formal complaints about a wall at this location, but a planning officer will be visiting the site in the near future. The landowner, who did not wish to be named, said he did not want to leave anyone stranded but insisted that the wall would stop people from going on his land and getting hurt because he had not secured it.